Emil Hyde, the amazing stationmaster and zine editor for 100% Unnatural, recently caught up with synthpop sensation moonlife. Here is how it went. 100% UN: Though your music is almost entirely synthesized, it really doesn't sound like your typical thump-thump techno. How would you characterize your sound and where, exactly, does fit into the turn-o'-the-century music scene? BILL: We write catchy 3-minute pop songs. It's all about the melodies and hooks. This sets us apart from techno, which is all about the beat, sometimes to the entire exclusion of a melody. Different goals, different taste. The fact that we use synthesizers is almost secondary. CLAUDIO: I've never quite figured out what "synth" music is supposed to be. It's like asking what "guitar" music is. Is it rock? Folk? Jazz? I've heard synth stuff from the 70's that's very new age and bubblegum. In the 80's there was new wave and euro-pop. In the 90's it changed to rave and electronica. The funny thing is all of these styles use synths but all stem from different genres of music such as punk, disco, rock, classical and dance. So, for me, the synth is just an instrument I like the sound of and use to write songs. I think our songs could be played on any instrument and that they are all strong "tunes" that you can hum. BILL: As for where we fit: I'd like to think there's always a place for catchy songs in the music scene. 100% UN: Live music has long been considered a guitar band's game, whereas electronic tend to hide out in their bedrooms and basements, never letting anyone see them at work. Nonetheless, Moonlife seems to be all about playing live. Could you tell us about your onstage experiences? How do they compare to working in the studio? CLAUDIO: Heh, heh, heh. I completely agree with you about bedroom and basement bands. I've always loved playing live but never really liked going to see local bands as they all tend to be bad rock or punk bands. Now, I like rock and punk but there were hundreds of bands playing and maybe 1 or 2 were good. The weird thing for me was that there were no synthpop bands playing live, so I decided that I'd change that. BILL: And since there aren't that many live-performing synth bands, this gives us a bit of niche to play in. There are some other really good synth bands that we play live with in San Francisco and, thankfully, we all sound entirely different. Having a bunch of synth bands to play with means we can pitch synth-only shows to club bookers. We've done about 4 of these shows so far. But we also play shows with a lot of more traditionally instrumented rock bands, and that works fine too. CLAUDIO: I remember the first time I played live with a synthpop band. People loved it. They went bananas over us. We've had some interesting live shows including the one with the huge biker dude that we thought was going to start a fight. We started playing and he loved it! It turned out that he used to be a huge "A Flock Of Seagulls" fan! BILL: Personally I thrive on playing live. I find it infinitely more satisfying than working on a studio project. It's quite an adrenalin rush. CLAUDIO: In the studio things are much more clinical and meticulous whereas live things are very dynamic and chaotic. There's immediate feedback when playing live that can really electrify your performance. 100% UN: San Francisco, Santa Cruz, San Jose, Las Vegas� you guys have been playing out all over the place. Is there any particular town where the audiences are especially receptive? Is there anywhere that the audiences have been especially hostile? BILL: I've always felt really comfortable playing in San Francisco. The music scene here is populated with some really cool people. It's quite an honor to be part of it. There seems to be nothing that's too far out for SF. And Santa Cruz seems pretty similar in that respect. I was a little nervous about how we'd go over in Las Vegas. But really, we've been pretty well received everywhere that we have played. The 'riot' in Las Vegas was pretty funny though. A very drunk bass player from one of the bands we were playing with that night made a bit of a scene and had to be escorted outside by security, not once but twice. All with a moonlife soundtrack. One of our friends who came to see us that night described it as the most surreal moonlife show he'd ever seen. But everyone there loved us, despite the unexpected excitement. CLAUDIO: There haven't been any hostile shows. Even when we've played in front of folkies or headbangers, they've all enjoyed our show. 100% UN: do you consider Moonlife's sound a throwback to the days of Depeche Mode and OMD, a continuation thereof, or a break from that school of synthpop? BILL: Other than being a synth band, we don't really have any real master plan for our music. We write songs that we like. We never set out to see how close to Erasure we could sound, for example. But Claudio and I are both big fans of Erasure, Human League, OMD, Depeche Mode, and the like. So it's pretty hard to not have that come out in our music. CLAUDIO: Definitely Depeche Mode! The thing I like most about DM is that they have broken down musical borders with their music. 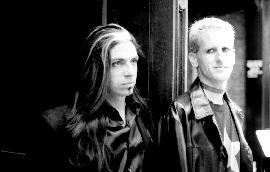 Even though they began as a synth-pop band they seem to be liked by people who are into punk, rock, metal, gothic, industrial, dance, techno and almost every other kind of music. BILL: And I'm also a big Gary Numan fan. I don't think our music sounds at all like his, but I'm usually conscious of riffs or sounds that I think are Numan-like when we're writing songs. Also, I think The Cars are an unconscious influence on the way I compose riffs. I used to listen to their first three albums a lot around the time that they were new - long before I ever started playing in bands. But I didn't realize the influence that their music had on me until much more recently when I listened to some of it maybe a couple of years ago. Pretty startling, really. Gee - maybe we should send Ric Ocasek a demo! 100% UN: I realize that music matters most, but do you mind if, to end this interview, we shift our focus to fashion? Moonlife is one of the few bands out there with an "openly Glam" aesthetic. Tell me, what was the initial attraction and what's been the general reaction to your spaced-out, high-maintenance look? BILL: "Openly glam"? [laughs] Yeah, we're WAY out of the closet about that (and, my, what a glittery closet it is)! There are actually quite a few bands in San Francisco that dress up, wear make-up, and put on really killer shows. To plug another mp3.com station for a moment, most of these bands are listed on the San Francisco Glitter and Glam station. CLAUDIO: I've always been personally attracted to glam fashion. It's not just music that influences me in new wave, but the fashion. Bands like Adam And The Ants, Visage, Duran Duran, early Motley Crue, early Poison, Dead Or Alive, and even as far back as Wizzard and Gary Glitter, all inspired me to put on a show. I loved the showmanship aspect. Overall, I think people at our shows really like the image. I've noticed that it's spreading to other bands too. I think people like that we're making an effort to put on a show rather than just standing there in jeans and a tshirt and staring at our navels! BILL: We traveled to Las Vegas in June for the EAT'M conference and spent a lot of time hanging out with members from Blue Period and Simon Stinger, a couple of our favorite San Francisco glitter'n'glam bands. Seems like wherever we are, everyone thinks we're all part of a single band. Most of the bands we saw performing at EAT'M were dressed to clean out the garage. So maybe it's just a San Francisco thing. Still, we believe that when people go out to see a band play, they want more than just to hear the same music that they can play in their cars. They want a show! And we try to give it to them. 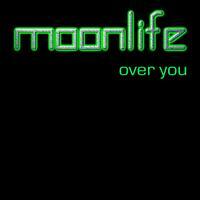 Over You is moonlife's latest release with four slices of synthpop bliss -- featuring the title track and the popular Satellite. Just $5.99! Buy it Now! Copyright 2001 Liquid Stereo. All rights reserved.